The Blood Pressure Cuff Barriers, by Tidi Products, makes it easy to help stem the spread of contamination and maintain a sterile environment while taking blood pressure readings from patient to patient. 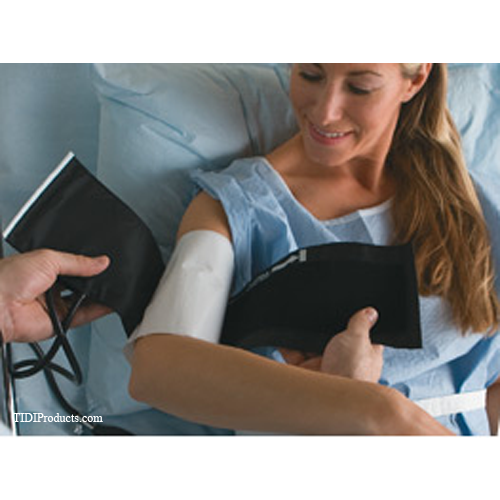 These blood pressure cuff covers are simply fastened around the patient's arm. They have a removable strip that exposes adhesive, so the tissue wrapped around the upper arm will stay in place. 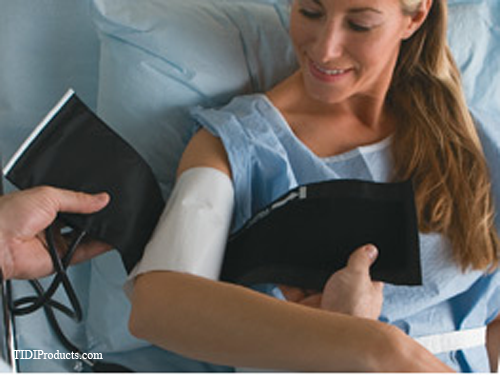 The Tidi Blood Pressure Cuff Barriers are one-time-use, disposable covers. They are made with soft, Fabricel® tissue that has a film of polyethylene to keep any liquid from leaking through. They are soft enough to make it comfortable resting against the skin under the blood pressure cuff and will not alter the readings. The tissue is made soft and will not irritate the skin. They come with size options and are latex-free. The cuff barriers will help prevent cross-contamination. A thin plastic barrier prevent liquids from soaking through. The cuffs are soft to the skin and will still allow accurate readings. The cuff liners are light, economical and are simply thrown away after use. They fit both arm and leg sizes. Does what you need it to do, no interference with the bp reading. Staff was friendly, shipping was quick..enough said.